Team Hardie delivered the World Mixed Curling Championship 2017 title for Scotland, defeating Canada 8-5 in the final in Switzerland. It was a superb achievement for the Scots, who also defeated Sweden and the Czech Republic en route to the world crown. Back in Scotland this weekend, Fraser Kingan and Jayne Stirling were surprise winners of the Scottish Curling Mixed Doubles Championship in Aberdeen. Team Hardie (Grant Hardie, Rhiann Macleod, Billy Morton, Barbara McFarlane) were Scotland’s representatives at the World Mixed Curling Championship 2017 in Champéry, Switzerland, as one of 37 teams at the event. They began with wins over Spain (9-7) and Ireland (9-2), but then lost their third match to Korea, 6-5, after giving up a steal in the eighth end. Undeterred, the Scots then reeled off four straight wins (beating Denmark 10-4, Luxembourg 9-2, New Zealand 8-2 and Kazakhstan 8-1) to safely progress to the playoffs, where they faced a rematch with Spain in the last 16. The other British teams at the event had mixed fortunes, with England (Andrew Woolston, Lesley Gregory, Martin Gregory, Kirsty Balfour) winning three and losing three in Group E to place fourth, and their last stone draw of 65.93cm qualified them for the last 16 – where they were edged out 6-5 by Norway. Ireland (Alan Mitchell, Jacqueline Barr, Ross Barr, Clare McCormick) finished fourth in Group C on a W4 L3 record, only to miss the playoffs on last stone draw, while Wales (Adrian Meikle, Dawn Watson, Andrew Tanner, Laura Beever) came fifth in Group A with three wins and three defeats. As for Scotland, they beat Spain 4-2 and then faced a quarter-final clash with Team Wranaa of Sweden, one of the favourites, and a fine team performance (with twos in ends one, three and seven) saw them win 7-4. Now on a roll, Scotland beat the Czech Republic in the last four – 6-2, with twos in ends one, two and four – to set up a final showdown with Canada, skipped by Trevor Bonot. After forcing the Canadians to one in the first end, Scotland took one in end two, stole two in the third end, and another one in the fourth, to lead 4-1. Canada did pull it back, with two in end seven and a steal in the eighth, but Scotland kept their cool, making a double takeout to score three in the extra end – their 8-5 win giving them the world crown. Skip Grant Hardie said: “The whole team played brilliant all week and especially the during the playoffs they came to the fore. I’m absolutely delighted. “They [Canada] came at us really hard at the end. They’re obviously a great team to get to the final and we just managed to hold on. “I’d thrown that line, four or five times in the game, so I was pretty confident but obviously with it being for the win you’re always a little on edge. It’s a fantastic achievement for Team Hardie, who had no coach at the tournament (but plenty of travelling supporters!). And for the skip, it’s the continuation of a great start to his season – having already won two events with Team Mouat – with plenty more to come. With mixed doubles now an Olympic sport, there were Olympians aplenty at the Scottish Curling Mixed Doubles Championship at Curl Aberdeen – Scott Andrews, Tom Brewster, Greg Drummond, Michael Goodfellow and Claire Hamilton all Sochi 2014 participants. Eighteen teams were split into three sections, with those groups being topped by Bobby Lammie/Rachel Hannen (W3 L2), Bruce Mouat/Gina Aitken (W5 L0) and Fraser Kingan/Jayne Stirling (W4 L1). With Lammie/Hannen and Kingan/Stirling progressing straight to the semi-finals (on draw shot rankings), the quarters pitted Scott Andrews/Claire Hamilton against Euan Kyle/Naomi Brown and mixed doubles specialists Mouat/Aitken against mixed doubles specialists Judith and Lee McCleary. Aitken/Mouat have won the last two Scottish Championship titles (four in all), but their 2017 challenge ended with an 8-5 loss to the McClearys, while Kyle/Brown won the other last eight clash 7-5. Come the semi-finals, Lammie/Hannen beat Kyle/Brown 6-2, and Kingan/Stirling saw off McCleary/McCleary 7-3 (meaning there would be a first-time champion this year). In the final, Lammie/Hannen got off to a flying start, scoring three in the first end, but singles in the next three ends drew Kingan/Stirling level at 3-3 at halfway. The momentum was with Kingan/Stirling, and they blew the match open with a huge steal of four in the fifth end. Although Lammie/Hannen pulled two back in the sixth, a further score of three sealed the win for Kingan/Stirling, 10-5. Having qualified for the World Mixed Doubles, Stirling said: “I’m still a bit shocked actually, and obviously really, really excited. Finally, the Stevenson Trophy (Under-17 Slam) also took place this weekend, with 20 junior rinks taking part in Lockerbie. After the round robin stage (five sections of four teams), and a quarter-final between Teams Middleton and Buchanan (won 13-4 by the former), the semi-finals brought wins for Team Craik over Middleton and Team Gallacher over Davie (both 5-4). Craik (Angus Bryce, Matthew McKenzie, Niall Ryder, Ross Craik, Laura Watt) took the title, scoring three in end three and twos in the fifth and sixth ends to win 9-5 in the final against Gallacher. 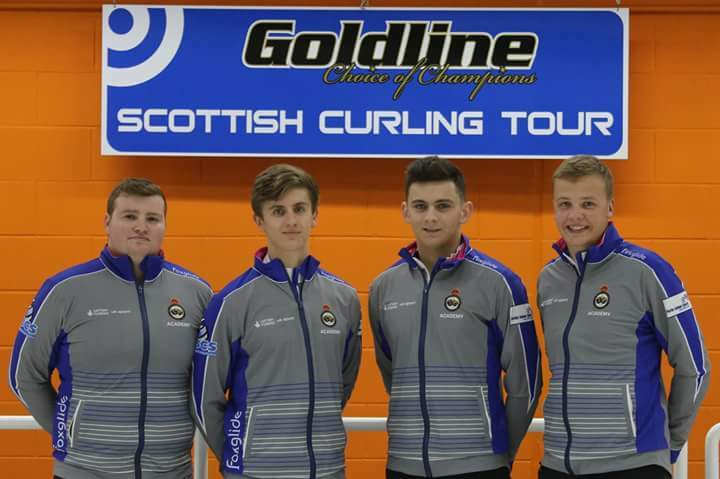 Team Bryce are an academy men’s team looking to provide a bright future for Scottish and British curling, currently competing in the Scottish Curling Tour and junior events. Q: Could you introduce the members of the team – how long they’ve been curling and what they bring to the team dynamic? A: Frazer Shaw (lead): I have now been curling for seven years – I started in my last year of primary school. I am an outgoing and competitive person. I really enjoy curling with my team because we have such a good friendship, built over the past couple of seasons. I feel that I bring an element of fun to the team when appropriate, as well as the desire and energy to win. Fraser Kingan (second): I have been curling for nine years. I am a very motivated and competitive person and always put my all into every game I play. This benefits the team as it helps us to all get fired up for each game which makes us all play better. Zack Stewart (third): I have also been curling for nine years since starting at Dumfries at the end of primary school. I am the most reserved member of our team – this allows me to keep a level head during our games and try to keep my team-mates’ heads in the right place when we are on ice. I am also highly motivated and I really enjoy pushing myself in training and games. 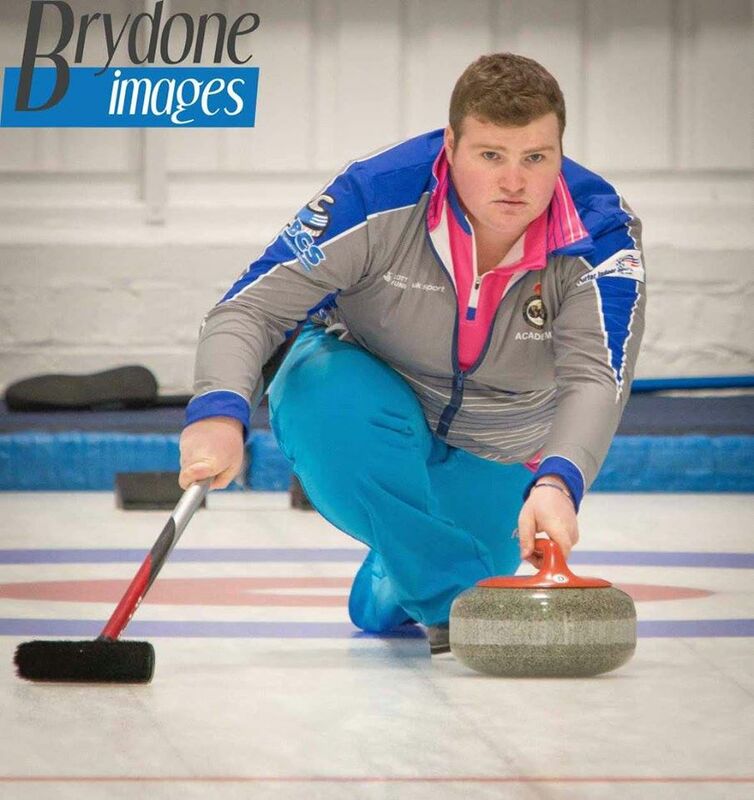 Cameron Bryce (skip): I started curling at the age of 10, also at primary school. This is my 10th season. On the ice I am quite laid-back when in play. I don’t get stressed or flustered when we are under pressure in a game. With Zack and myself being calm, it benefits our team in big games. I am highly motivated and I train at every possibility, to get the best out of myself. Q: Cameron, you skipped the Scottish team at the World Mixed Curling Championship last month – how would you sum up that experience? A: In my first experience on the world stage, I found my time very enjoyable. It was a great stepping stone for the season ahead and beyond. It definitely helps for coping with some pressure situations and makes me hungry to be back at a world championship event in the near future. Q: This is your third season together – how does that familiarity help you out on the ice? A: It gives us a real consistency both on and off the ice. We know when we need the support and can work really well together when this occurs. We all know each other’s strengths and we can really use that to our advantage when at competitions. The attributes we all bring to the ice are really positive. Going into the start of this season we are all putting that extra effort in, both physically and mentally. Q: You have a new coach – Keith Prentice. What does he offer you as a team? A: First of all, Keith has a lot of great experience in curling – from coaching high performance teams over the past few years, to competing for Scotland in the World Senior Championship, and winning. Keith has been in many situations we aspire to be in, going into major championships, and we feel he is the right person to help us achieve our goals. We hope this combination can work really well to build a similar sort of consistency in our game. Q: How happy were you with your 2014-15 season overall? A: We felt the 2014-15 season went really well. We achieved some great results throughout the season, our highlight being the Scottish Men’s Championship. However, we didn’t play our best in the junior finals – so if we had to say the result we were most disappointed in, it would have to be that. Q: Looking ahead, what are your ambitions for the 2015-16 season? A: Our main ambition for the season is to win the Scottish Junior Championships. But this is just a stepping-stone for our team ambitions – to compete and medal in the World Junior Championships.